Synopsis from Goodreads: On a warm summer morning in North Carthage, Missouri, it is Nick and Amy Dunne’s fifth wedding anniversary. Presents are being wrapped and reservations are being made when Nick’s clever and beautiful wife disappears. Husband-of-the-Year Nick isn’t doing himself any favors with cringe-worthy daydreams about the slope and shape of his wife’s head, but passages from Amy’s diary reveal the alpha-girl perfectionist could have put anyone dangerously on edge. Under mounting pressure from the police and the media—as well as Amy’s fiercely doting parents—the town golden boy parades an endless series of lies, deceits, and inappropriate behavior. Nick is oddly evasive, and he’s definitely bitter—but is he really a killer? First the positives: This book has dual narrators told from the point of view of both Nick and Amy, a young couple who has been married for 5 years. Don’t think for a second, however, that because you are getting two narrators instead of one that you are getting a more comprehensive story because both of these narrators are liars. I absolutely LOVE books that have unreliable narrators (what does that say about me as a person I wonder?? Hmm…) The main focus of this book is that Amy has gone missing and Nick is the main suspect in her disappearance and later her homicide. THAT IS SUCH A BASIC, LOW-KEY DESCRIPTION BECAUSE THIS BOOK IS SO MUCH MORE COMPLEX THAN THAT! I cannot stress that point enough. Just when you think you have it figured out, Gillian Flynn throws you another curve ball to make you question EVERYTHING! You will go back and forth between loving and hating both Nick and Amy. First you will love Nick and hate Amy. Then you will feel bad for Nick and hate Amy even more. Then the script gets flipped and you will LOATHE Nick and feel bad for Amy. By the end of this book, you won’t know who you hate more! It has so many twists and turns it literally makes your head spin. I won’t say anymore plot wise for fear I may ruin something but my God by the end of this book, I needed to take a shower! Those of you who have read it I am sure will agree with that and know what I mean! Now the not so good and really it’s just one miniscule item: because this is not teen fiction and what my friends and I jokingly refer to as “adult fiction” and not something I normally read, I did feel it dragging in places in the beginning. It felt a little wordy in spots but man, once you get to the first major plot twist, the story really moves from there on out. It was hard to put it down once it gained momentum. A few words on the movie adaptation: as far as adaptations go, I felt this one was decent. Loved the cast and their portrayals of the characters. I thought Rosamund Pike was the PERFECT Amy Dunne; she was both beautiful and terrifying. It was like the cliff notes verison of the book. Obviously they can’t include everything, but really did a good job of showing the major plot points. I really appreciated the ending because they took it a little bit further (timeline wise) than the book. Overall, it was really well done and really under appreciated, I felt. This is the perfect transition book from summer into fall. 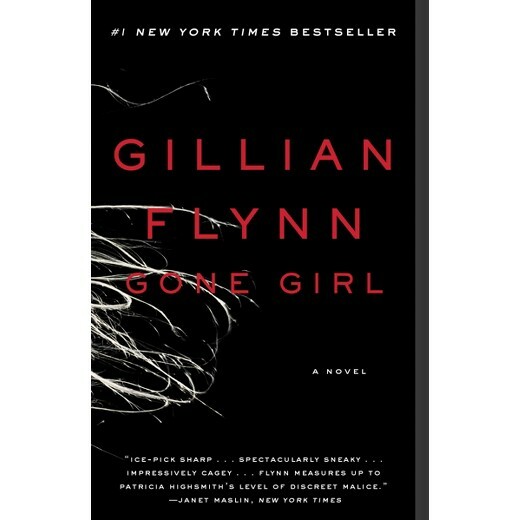 If you are looking for a suspenseful thriller that will keep you guessing until the very end, look no further than Gillian Flynn’s Gone Girl. Here is a link to the movie as well. Top 10 YA books I am most excited to read next!